The report of the three interlocutors on Jammu and Kashmir has recommended setting up of a Constitutional Committee to examine threadbare all Central laws. 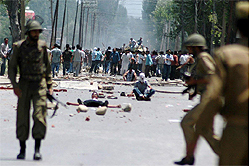 The three-member panel was formed after Valley witnessed a series of violent clashes in 2010. A Ghaziabad court today charged dentist couple Rajesh Talwar and Nupur Talwar with murders of their daughter Aarushi and their domestic help Hemraj. Focusing on free and fair elections to civic bodies in Punjab, the Punjab and Haryana High Court today permitted videography in the polling booths. Estimates suggest the High Court nod will go a long way in ensuring fair polling in no less than 90 per cent of the booths. After fighting a prolonged battle with Gujarat Chief Minister Narednra Modi, the RSS was today forced to acknowledge his growing stature as it reluctantly gave in to his demand to oust his arch rival Sanjay Joshi from the BJP�s national executive. Pakistan and India began their first round of two-day interior secretaries-level talks that focused mainly on liberalising visa regime and anti-terrorism cooperation. Pakistan�s Interior Secretary, Khwaja Siddique Akbar, and his Indian counterpart, Home Secretary RK Singh, led their respective delegations. A day after the Army Chief General VK Singh issued a show cause notice to Lieutenant General Dalbir Singh Suhag, it has now turned out that the Ministry of Defence was in the dark about the developments and was taken aback as the Army headquarters had, a few weeks ago, sent Gen Suhag�s name for a promotion. Three unswept, unkempt rooms 20 children call their home and a childhood suffocating in the blank walls that surround them.